Visitors to The Peak on Hong Kong island look out over Victoria Harbor, beyond which lies the Kowloon district and the border with mainland China. The urban space below, once known as Victoria after the British queen, formed the core of the British settlement after Hong Kong island was handed over as a colony by the Qing Dynasty in 1842 following the First Opium War. Today as Hong Kong approaches the 20th anniversary of its return to China, the waterfront remains a bustling commercial and financial center as well as the location of the city legislature and other main government offices. However, along the streets that angle sharply up to Victoria Peak above, a more relaxed pace of life endures, with bars, restaurants, boutiques and more traditional shops lining the narrow lanes. Street art brightens many of the exterior walls with a whimsical feel. 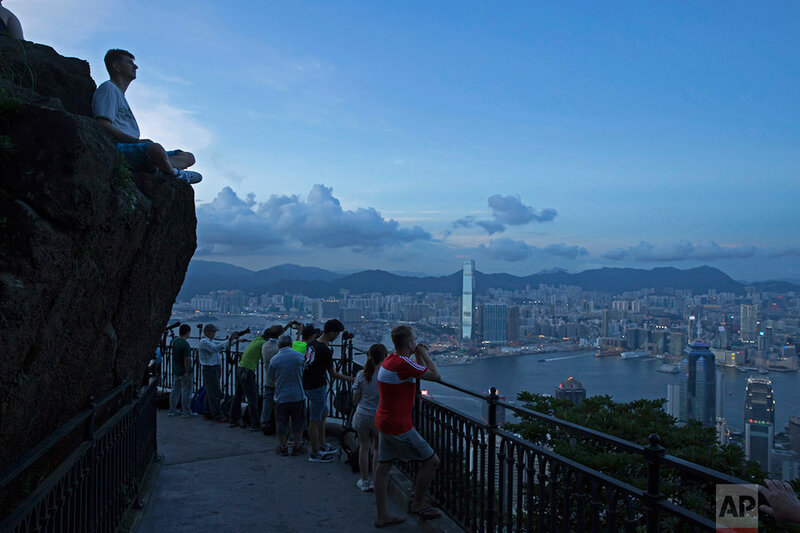 Text from the AP news story, AP PHOTOS: A peek at The Peak in Hong Kong.